The trend in accumulated road and bridge repairs is an indicator of whether we are sustaining the state’s economy, which is heavily dependent on transportation. An increase in needed repairs over time suggests that we may be heading for both physical and economic bottlenecks, as transportation may become an increasing constraint on the ability of freight and people to move to and through New Jersey. As a major transportation hub for the east coast, this is a significant concern in terms of the future of our economy. Systematic data with which to track this indicator are not available. In the past, the Department of Transportation estimated the cost of needed repairs, but they do not do so any more. (1) The most recent Statewide Transportation Improvement Program describes expected investment expenditures, but does not place this in the context of the full list of projects that are needed. Members of the DOT staff estimate the current need to be about five billion dollars worth of repairs. Significant investments would be needed for the state to meet its target of $1.3 billion in needed repairs in 2010. The backlog in repairs is related to another question, whether capital funds should be spent to repair the existing transportation system or to build new infrastructure. 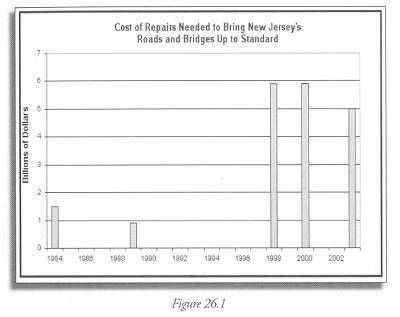 In 1998 a Quinnipiac College Poll found that New Jerseyans believed that resources should go into repairs before they went into new construction. (2) The subsequent 2000 Transportation Trust Fund Reauthorization Act incorporated this strategy, directing DOT to use the funds provided to make half of the needed repairs to the state’s transportation infrastructure, rather than spending those funds on new construction. However, the trust fund has not consistently been used as planned. In 2001 a group of transportation advocacy groups brought up a complaint against DOT because its 2000 capital plan dismissed as infeasible the obligation to make half of the needed repairs. The Appellate Division of the New Jersey Superior Court ruled in their favor in spring 2003, saying that DOT had not justified its claim that this was an unrealistic objective. (3) Moreover, although the trust fund is intended for capital rather than operating expenses, in 2003 some of its resources have been added to the general fund and others have been used to help meet NJ Transit’s operating deficit. These trends suggest that the state is not likely to catch up on its maintenance backlog in the foreseeable future. More reliable estimates of the need for repairs to the state’s infrastructure are necessary in order to track this indicator in the future. By 2010 reduce the backlog in road and bridge repairs to $1.3 billion.